At close of business the 2018-03-13 the VIX was trading at 16.4 at the 43.3 percentile. 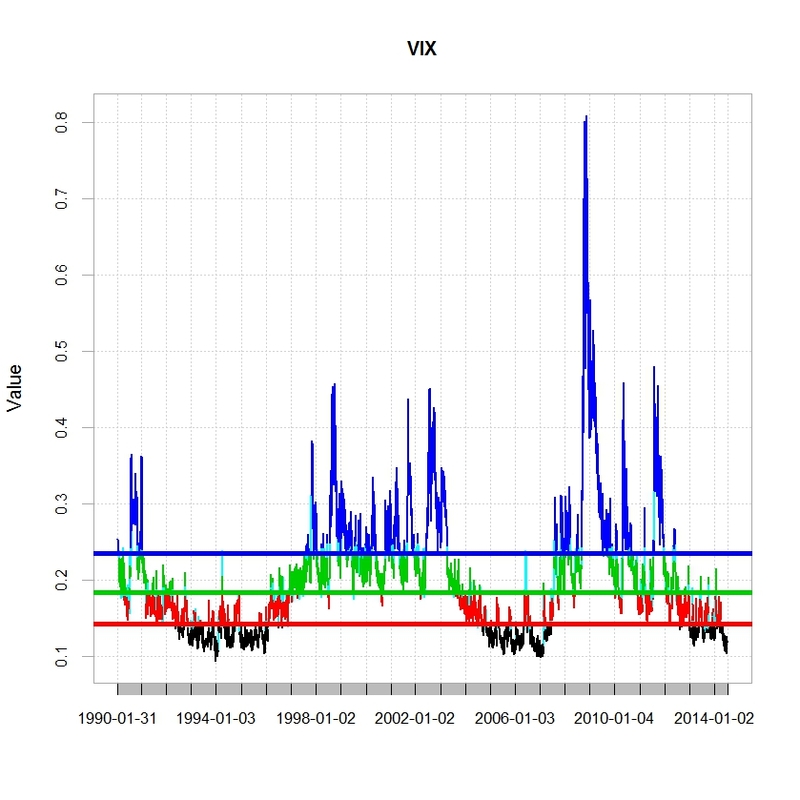 The 14-day VIX Volga was estimated at 26.4 its 89.7 percentile and the shockindex at 0.9 or its 68.9 percentile. Since 1990 the VIX traded 55 % of the time in Cluster 1, 34 % in Cluster 2, 9 % in Cluster 3 and 2 % in Cluster 4. 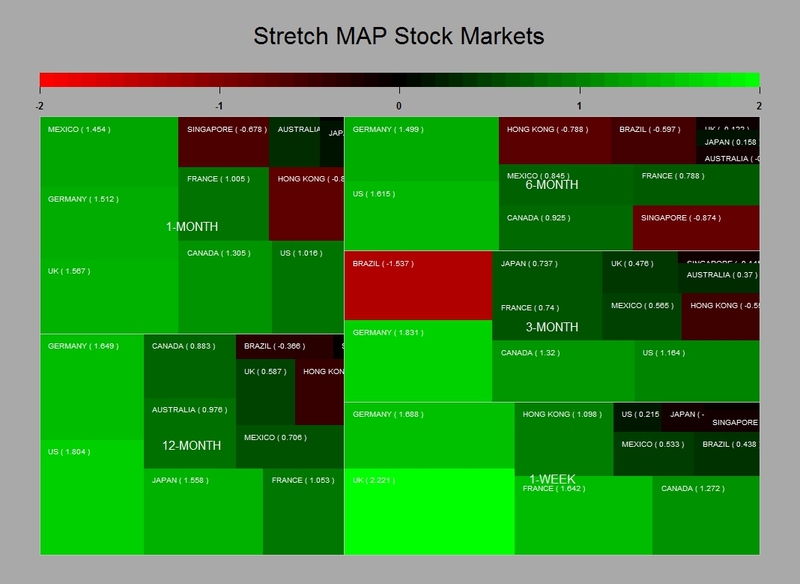 Overall the layering provided seems quite intuitive as the increase in risk and time spent in each cluster points toward what would generally be expected from market risk regimes ranging from low to high risk. In the chart below we zoom on the various regimes within which the VIX has been trading for the current year. so far it traded 65 % of the time in Cluster 1, 24 % in Cluster 2, 11 % in Cluster 3 and 0 % in Cluster 4. Posted in Uncategorized on March 13, 2018 by Pierre. At close of business the 2017-03-06 the VIX was trading at 11.2 at the 3.1 percentile. 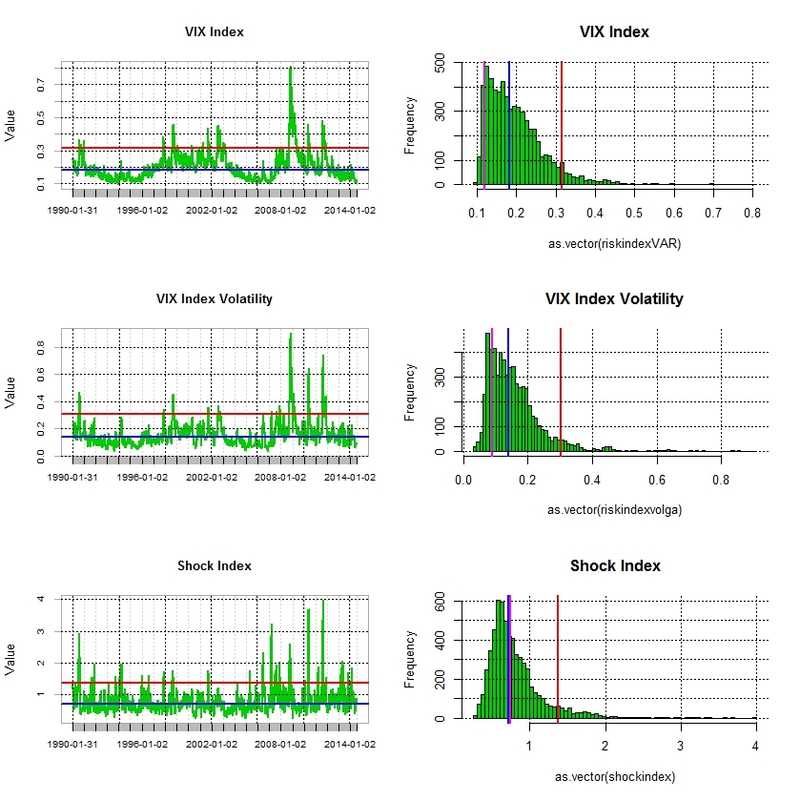 The 14-day VIX Volga was estimated at 7.8 its 11.3 percentile and the shockindex at 0.7 or its 37.9 percentile. Since 1990 the VIX traded 38 % of the time in Cluster 1, 45 % in Cluster 2, 15 % in Cluster 3 and 2 % in Cluster 4. 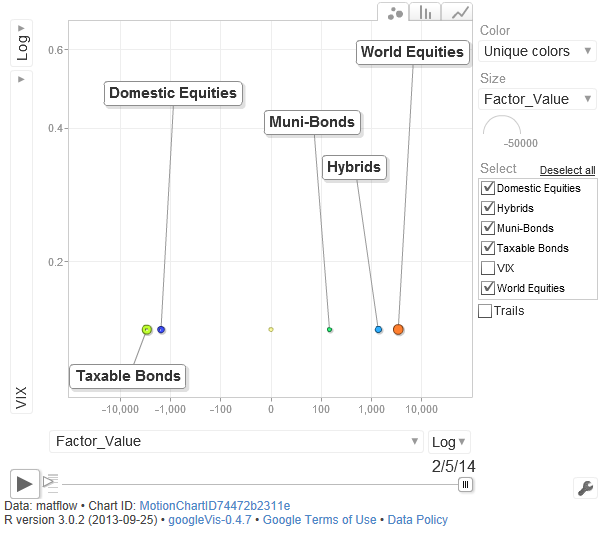 Overall the layering provided seems quite intuitive as the increase in risk and time spent in each cluster points toward what would generally be expected from market risk regimes ranging from low to high risk. In the chart below we zoom on the various regimes within which the VIX has been trading for the current year. so far it traded 46 % of the time in Cluster 1, 32 % in Cluster 2, 22 % in Cluster 3 and 0 % in Cluster 4. Posted in Market Risk, Uncategorized on March 7, 2017 by Pierre. Posted in FX, Uncategorized on November 29, 2016 by Pierre. Ok we have had our fair share of event risk so far this year. Ukraine, Israel, Portugal to name but a few….and we now have Yellen telling us that the Fed may hike the rates earlier than forecast. And guess what ? The Vix is still trading in the low bottom quartile. 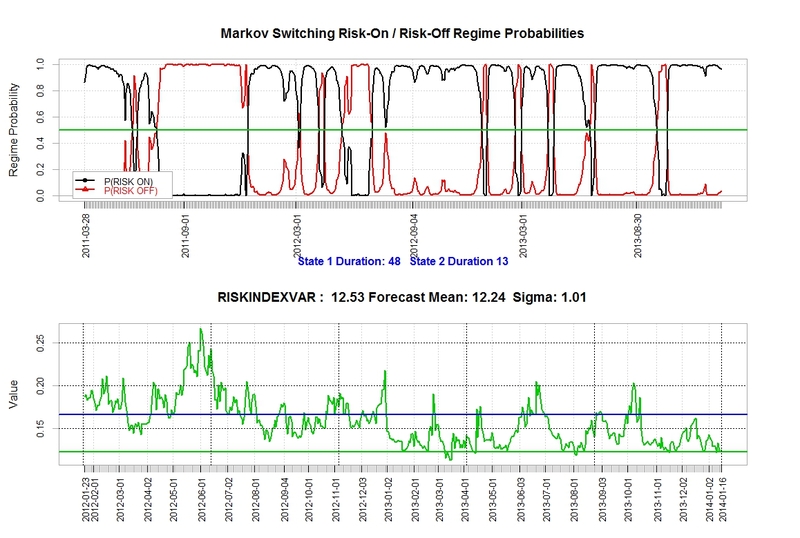 Though my shock Index (ratio of VIX volga and Vix over 21 days) did venture above its long term median value on the back of the Portugal news, all of my risk indicators remain well entrenched in risk seeking territory…. 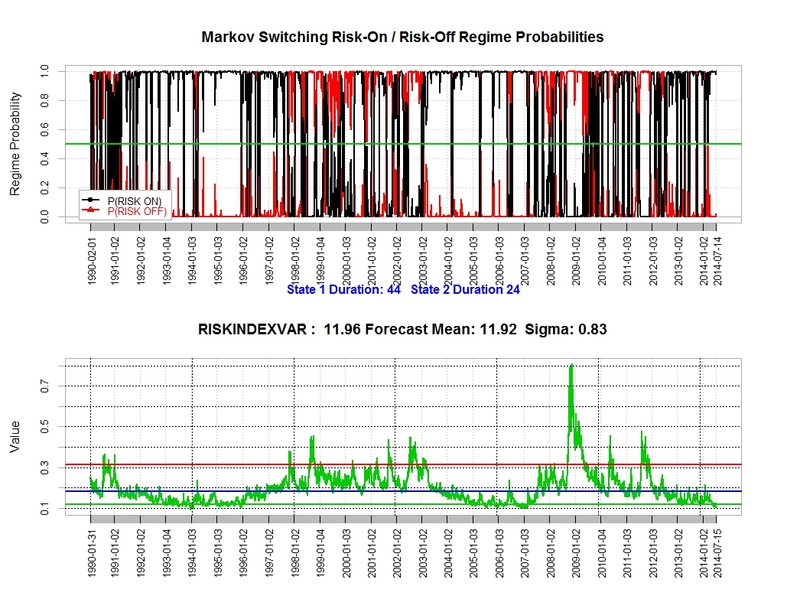 My 2-state Markov model continue to sell volatility…I am not sure I would but I can t fault the outcome of the model so far. 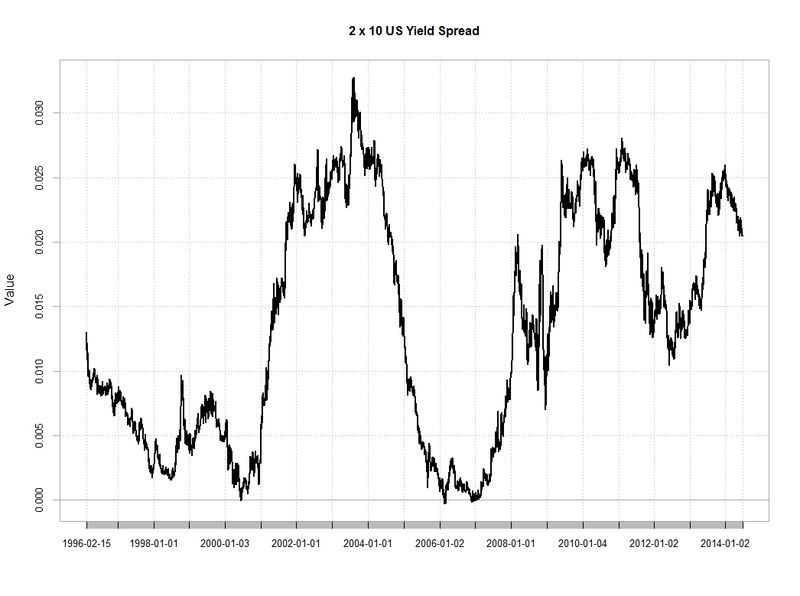 Posted in Market Risk, Uncategorized on July 16, 2014 by Pierre. Is The Fed Changing Its View About Inflation ? Yesterday in her Semi-annual Monetary Policy Report to the Congress, Chairman Janet Yellen stated the following: “If the labor market continues to improve more quickly than anticipated by the Committee… then increases in the federal funds rate target likely would occur sooner and be more rapid than currently envisioned.” However Treasury yields have barely moved and the dollar appreciation again the Greenback remained muted . The Euro depreciated only by 0.6% against the US Dollar since her speech. 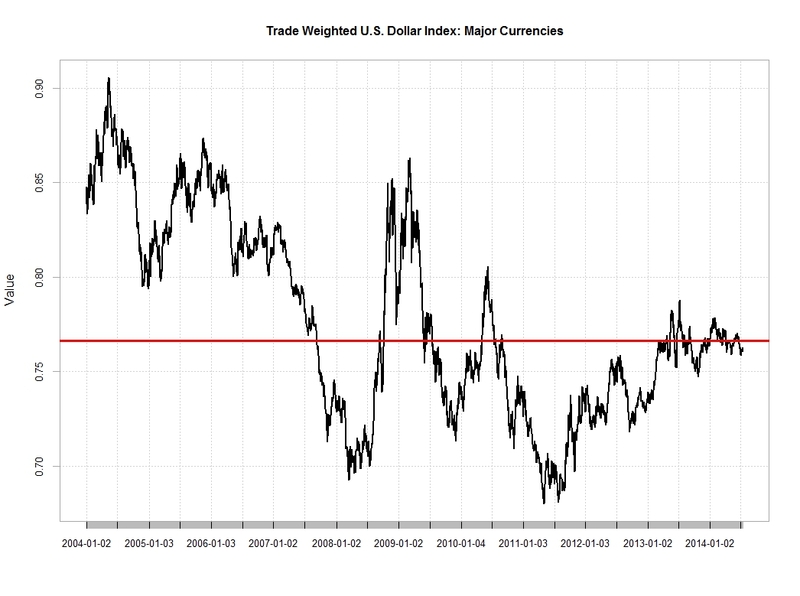 As shown from the chart below though the dollar against a broad basket of currencies is fairly well priced this is not the case for 10-year yields. Against all odds, Yellen seems to have managed to contain market expectations yet again. This is quite outstanding when one looks at the hard data. 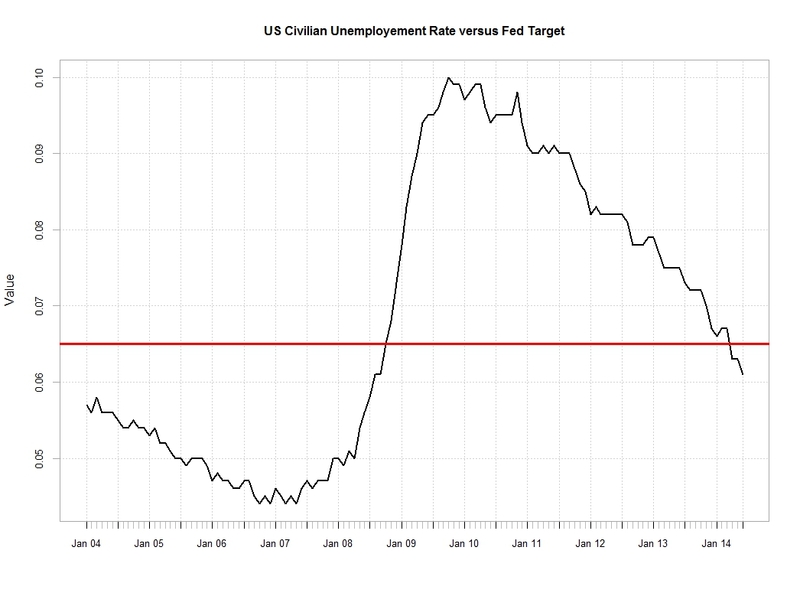 Unemployment is clearly below the 6.5% Fed target level. 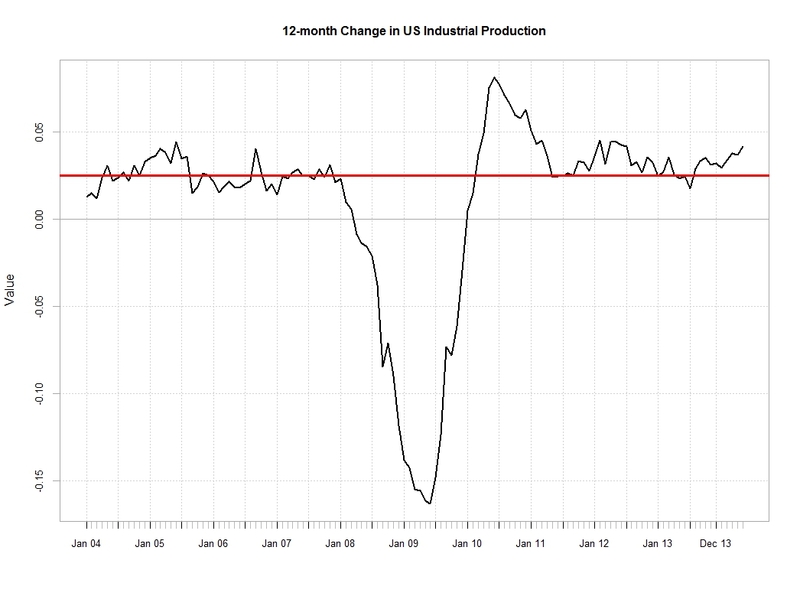 Also the rise in industrial production is quite telling of an even lower unemployment rate in the months to come. 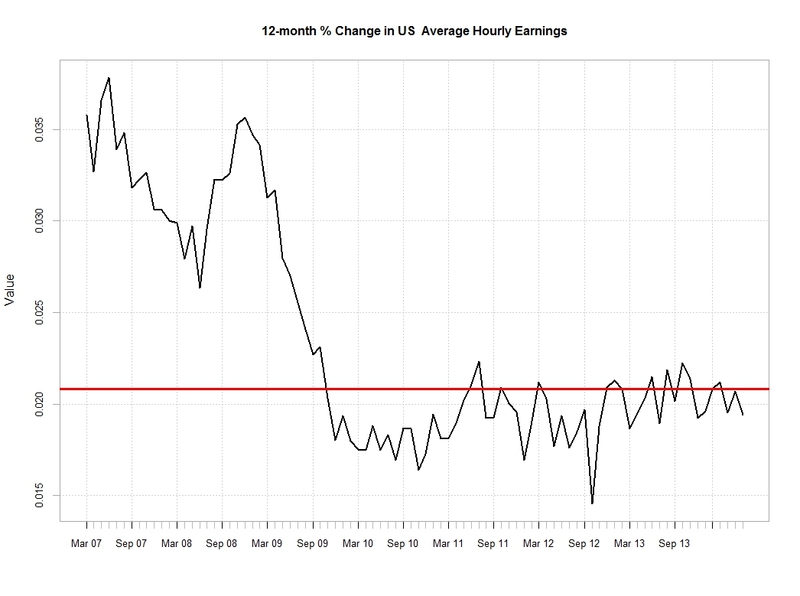 It is true that we have not yet seen much wage inflation in the us. The annual rate of increase in the average hourly earnings remains below 2% as shown below. Wages remain dampened by the spare labour capacity. Clearly the Fed has accepted to remain behind the curve for quite a while so as not to compromise any renewed growth in the US. 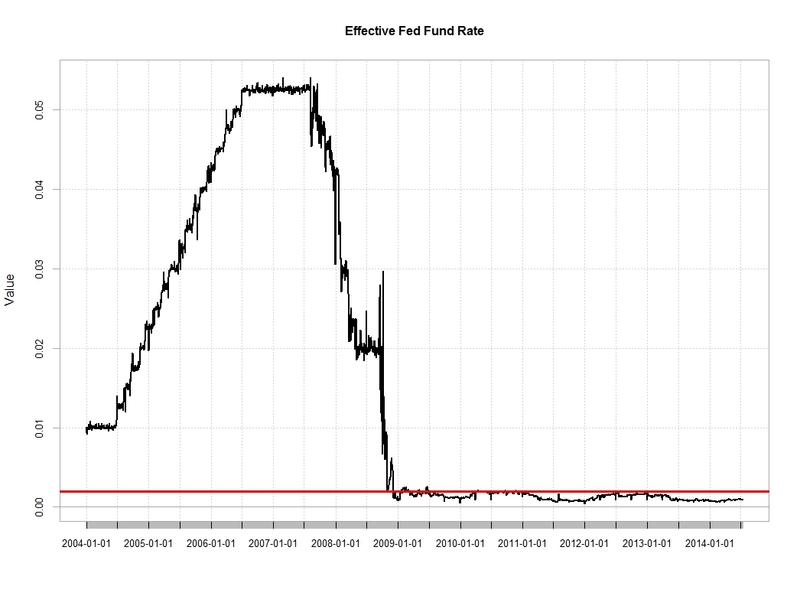 The current low level of the Fed fund rate is a good illustration of this. Contributing to a generally dim view on the US economy by Fed members could be that many forecasting models use 2×10 spreads as an input to forecast GDP. 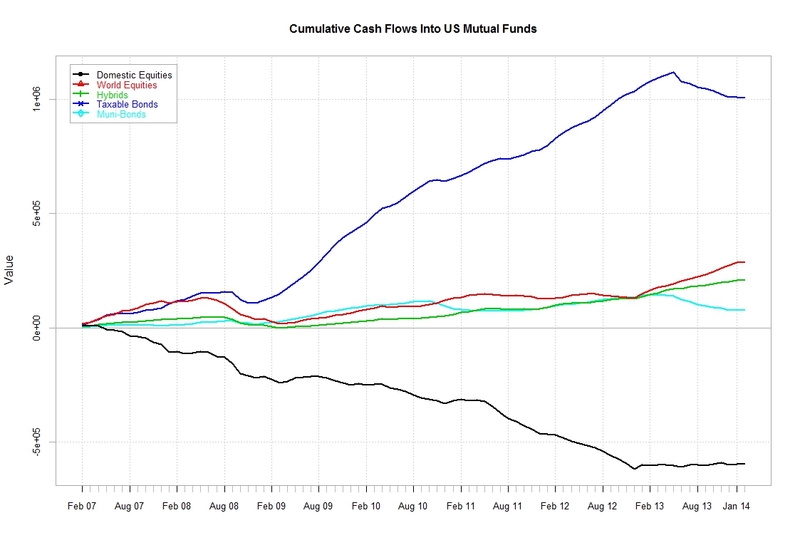 The abnormally ultra-low fed fund and therefore current steepness of the curve could contribute to why the Fed growth forecasts may not be as accurate as should be. After all even the IMF got it wrong with its growth forecast for the UK. 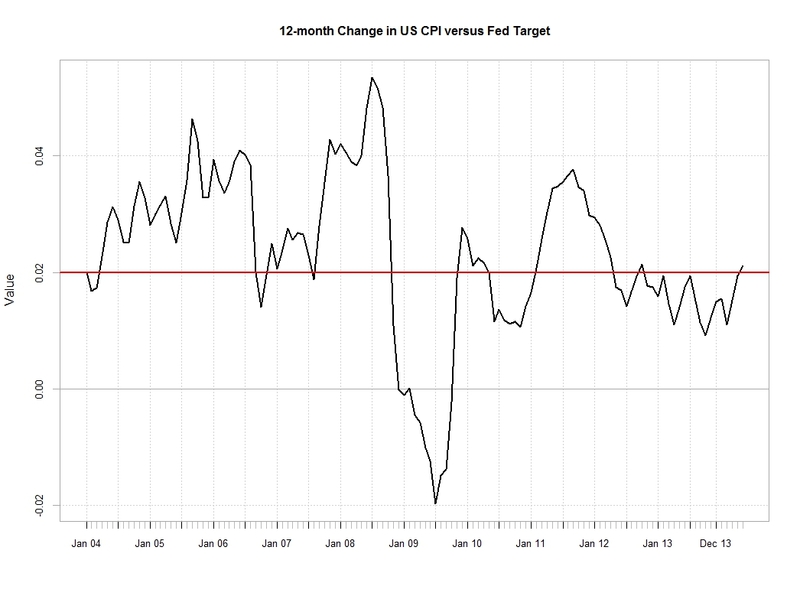 It is now noticeable that over the last few months, Inflation has crept above the 2% target of the fed as indicated by the below chart. This is not surprising as trend in consumerism and aptitude of price increase is somehow function of employments and wages earned. Though arguably not yet at an alarming level it will be interesting to watch out how the Fed react to further developments. So is the Fed starting to worry about inflation ? 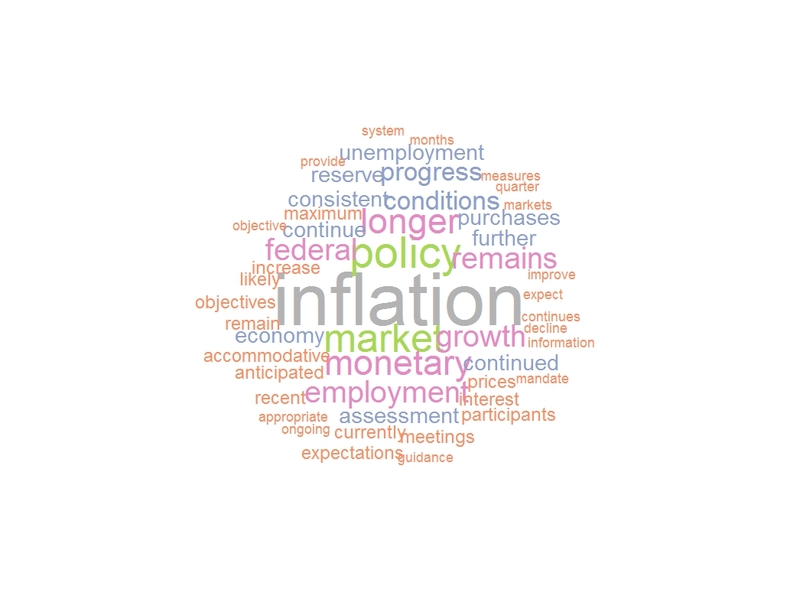 Plotting a Word Cloud of Yellen’s speech it is indeed quite clear that Inflation is the central issue ….. 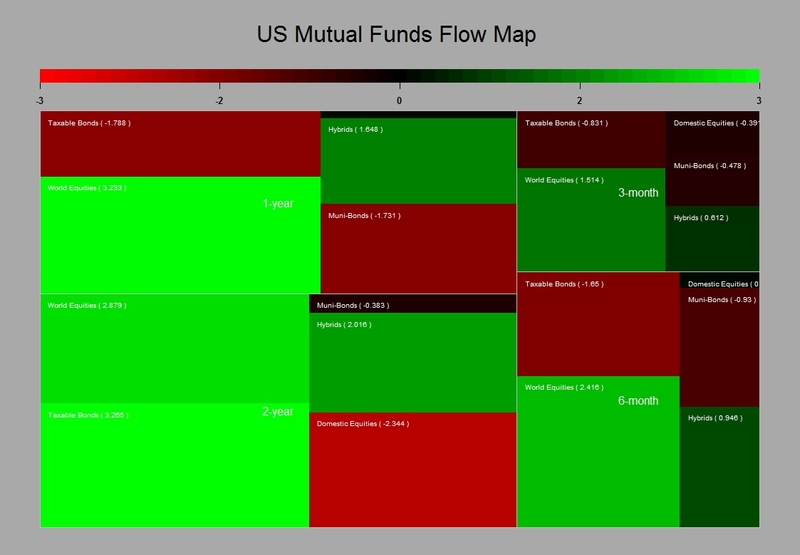 Bearing in mind the above it will be interesting to watch out for changes in the pattern of the inflows/outflows in US mutual funds. My thought is that we could see a resuming of the exit of bond products which was compromised by the ultra dovish tone adopted by Yellen when she took office. 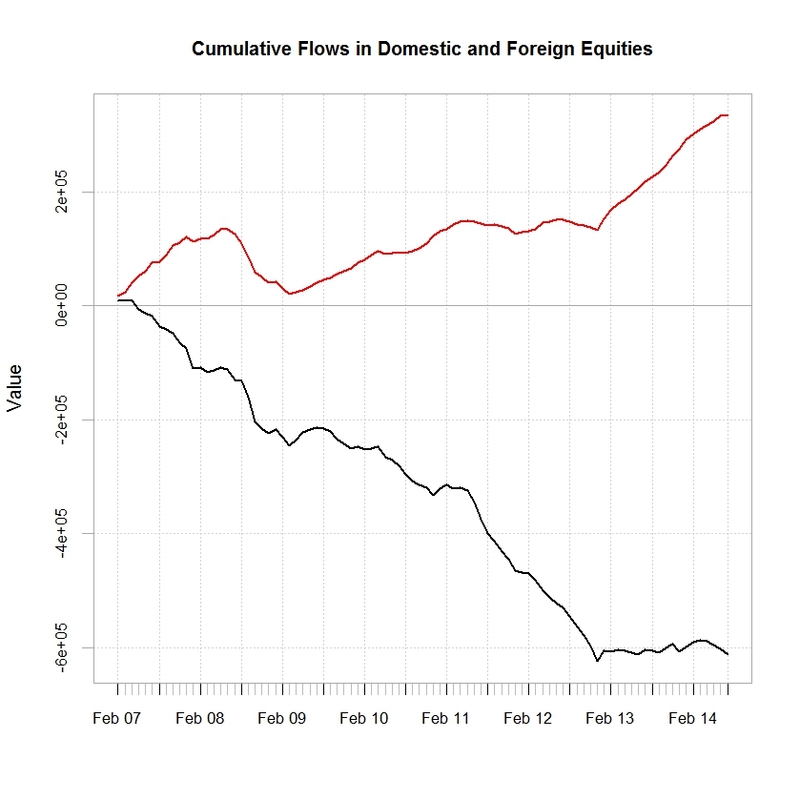 As mentioned in my previous post , the relative inflow/outflow in US versus foreign equities could also have a perverse effect on the valuation of the US Dollar. 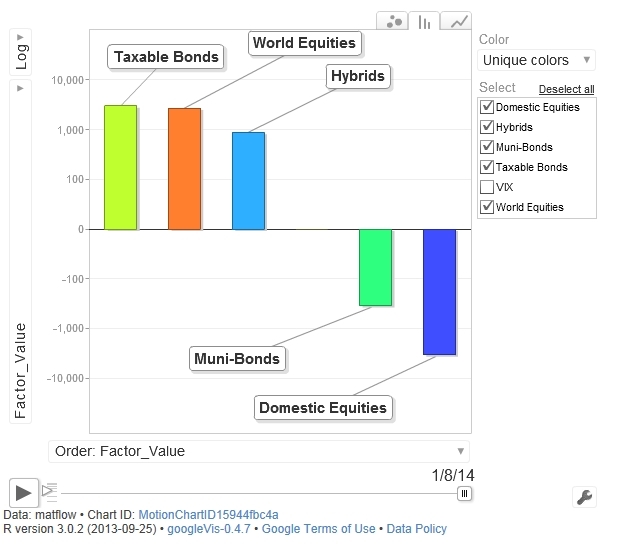 High rates are not necessarily a long term driver of currency , capital flows are more important. 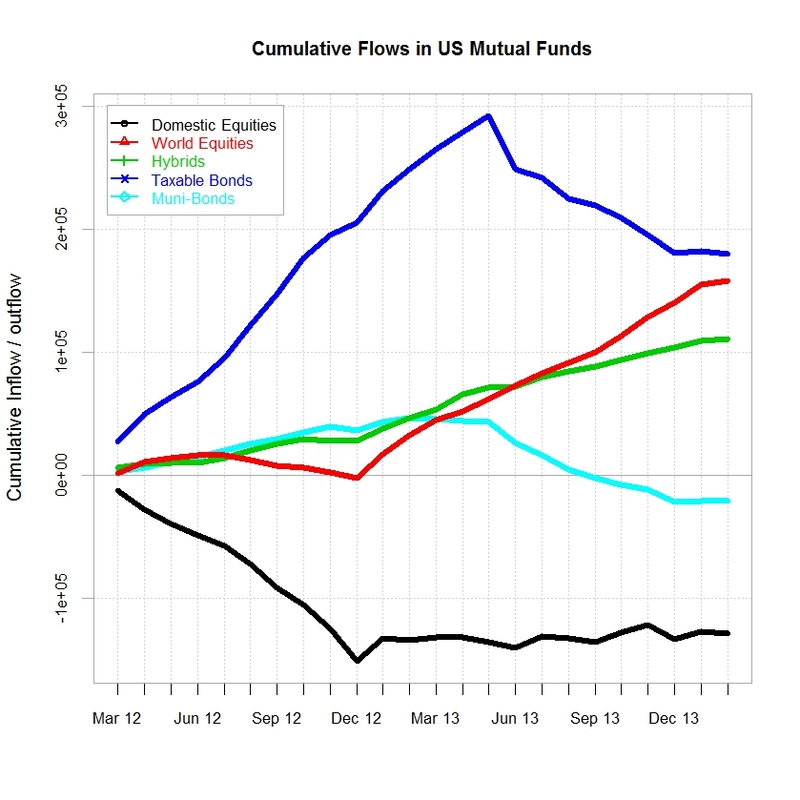 As a remainder of the current trends in US mutual funds below are couple of charts of my previous post. 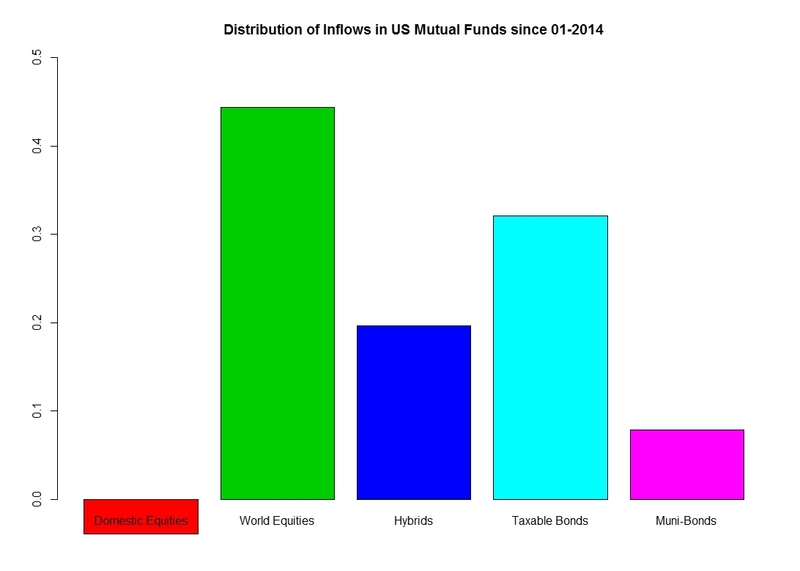 They show the distribution of the inflows/outflows in US mutual funds by asset class since the beginning of the year and the cumulative flows in domestic versus foreign equities products since 2007. 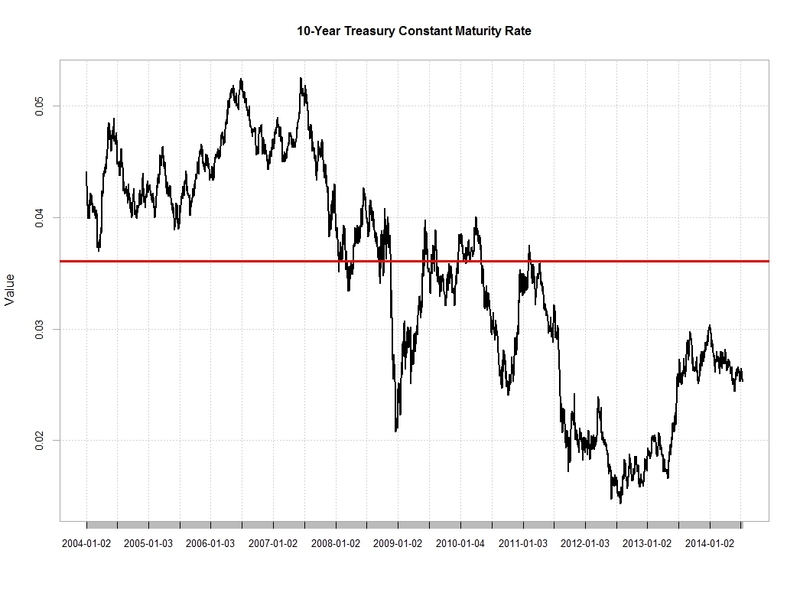 I’ ll stick to my Long global equities and short dollar view…..
Posted in Bonds, Fed Policy, FX, Stock Market, Uncategorized on July 16, 2014 by Pierre.